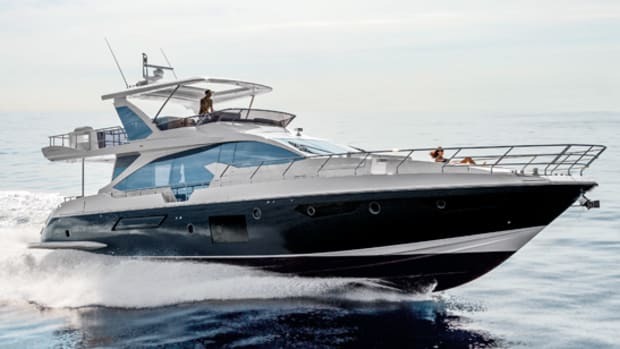 Our boat test of the Azimut 66 Fly. 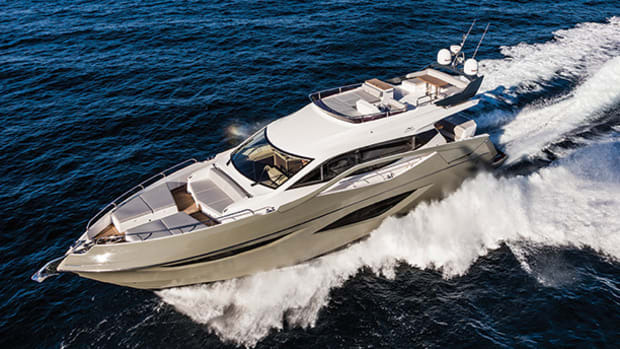 The Azimut 66 Fly may readjust your priorities for your next boat. To my eye and mind, beauty in boats lies in the literal form that follows function. At least it used to. I can admit that in my advancing age, I have learned to evolve a bit, to appreciate the simple pleasure derived from a delightful curve that does the job just as well as a purely utilitarian angle—so long as the job is done just as well. And so it was that I found myself at Boot Düsseldorf—an enormous indoor boat show held in Germany each January—standing on the bow of the Azimut 66 Fly with Giovanna Vitelli and Alessandro Rossi, vice president of Azimut Yachts and chief technical officer at Azimut Benetti Group, respectively. We were looking at the way in which the expanse of bow was put to good use, with both a low-profile settee across the lower edge of the windshield (featuring an optional electric bimini) and a sunpad forward. The foredeck was wider farther into the forward section than a traditionally shaped yacht, thanks to the lines of an obtusely angled bow—like the blade of a spade—that let the hullsides carry more beam farther forward. Something in my brain clicked. Not to be too dramatic, but the scales fell from my eyes and I saw all the shapes and swooping lines fit together with a clarity that, admittedly, had eluded me before. I think the reason it became clear at that moment was because of my company: We were discussing the 66 Fly—and incidentally, she’s no less sculpted than any other Azimut—from the technological perspective, and in that way her beauty runs far deeper than her skin. 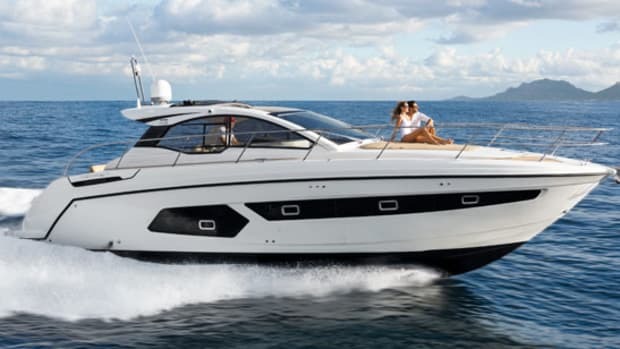 Azimut Yachts, founded by Paolo Vitelli in 1969, is one of the largest boatbuilders in the world as part of Azimut Benetti. The company has been on a tear in the R&D department, with a publicly stated plan to launch 14 new yachts over the next three years. 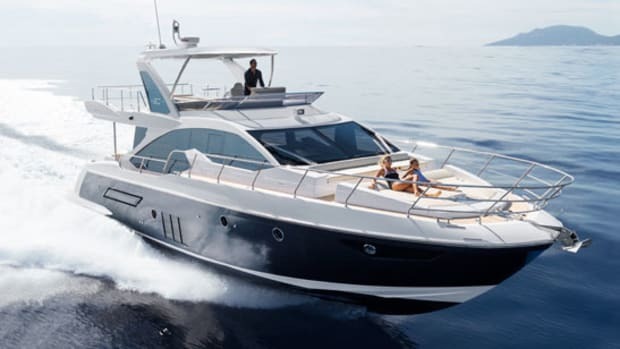 Azimut builds boats under numerous brand designations, including the S express cruiser line; the smaller, sporty Azimut Atlantis and Verve lines; Magellano semidisplacement cruisers; and Grande large yachts. 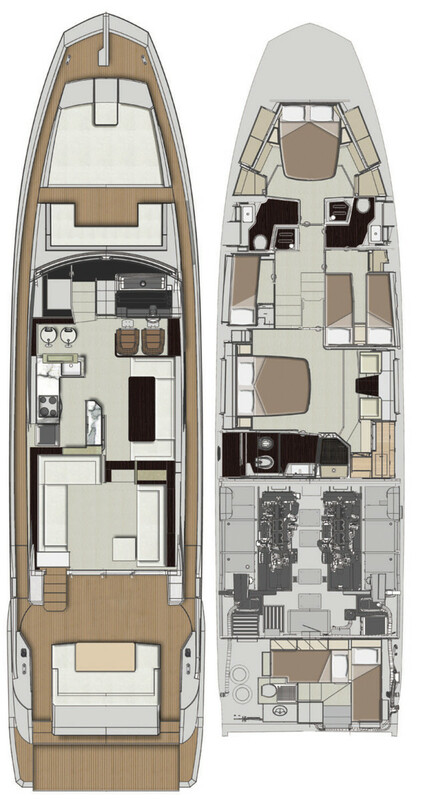 But the most representative division is the Flybridge range, which spans from 42 feet up to the 100-foot Leonardo. The 66 Fly falls right in the meat of the order, and it takes up the mantle carried proudly by the 62 and 64, which combined for 300 units sold since 2002. I made a trip to Italy to visit some of Azimut’s facilities and offices, and the chance arose to also sea trial this boat off Savona, Italy, just west along the coast from Genoa. The 66 Fly is a four-stateroom, flying-bridge yacht powered by conventional shaft drives with rudders. 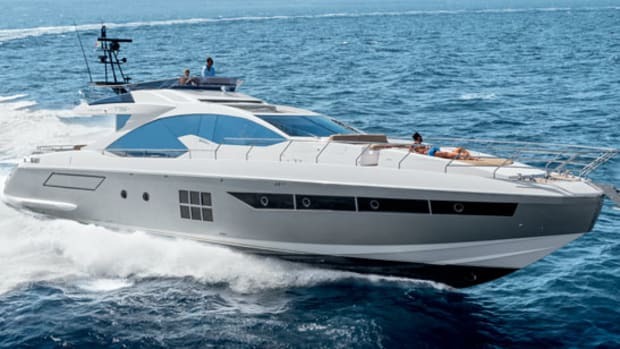 Now that that’s out of the way, you should know that this Azimut is the latest build from a company that has learned from what it has done in the past. The result is an accumulation of technology and an understanding of what works and what doesn’t. Azimut has engineered a huge amount of space in this boat, from the hull on up. I’ll cut right to it: The company touts this as the largest flying bridge in its class, but we’ll stick to the measurement—Azimut says it’s 28 square meters, which would make the space larger than 300 square feet. There’s a hardtop over the forward two-thirds of the flying bridge, with a retracting fabric sunroof panel. 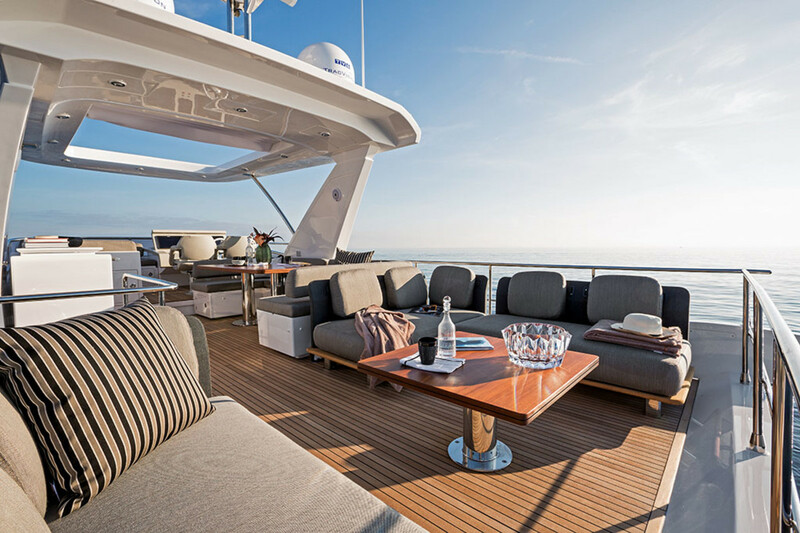 The flying bridge has what amounts to three separate seating areas, with loose furniture aft, an amidships, U-shaped dining area with alfresco galley, and a dinette that converts to a large sunpad to port, opposite the starboard helm station. That helm station has a low dashboard with a racy wheel and great lines of sight from the seated position for running, though for docking I’d prefer the helm and stairwell to the cockpit be lined up to improve the view aft. The advantage of the engineering is apparent in the way this boat handles at sea, and I drove her from both the flying bridge as well as the lower helm. Vitelli and Rossi had told me in Germany that they paid attention to the seakeeping and dynamic stability, which I experienced firsthand. They said that carbon fiber can be used to remove weight from a boat and improve its top speed, but it can also be used in a design that allows larger, taller structures, such as the house, flying bridge, and radar arch, thus adding volume without compromising performance. Combine this with a fiberglass hull made exclusively with vinylester resin, and vacuum-infused to hit the proper resin-to-glass ratio for strength and weight. Indeed, 90 percent of the molded components on the boat are infused. 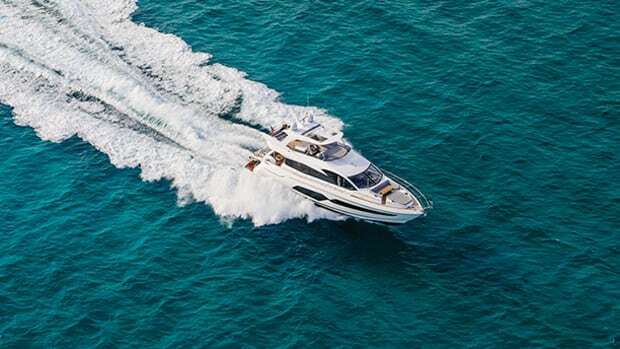 The hull has 20 degrees of deadrise amidships and 17 degrees at the transom, with conventional shaft propulsion (1,150-horsepower Caterpillar C18 ACERTs matched to ZF reduction gears) that gives you the oomph you want, to the tune of a fast cruise of 27 knots, but also with the manners you want in a boat of this size and caliber. That’s where the SeaStar electronic power steering comes in, with a tuneable setup that adjusts rudder angle to speed, to make the boat responsive to helm input and conditions. Under benign sea conditions, we saw this boat zoom through its paces, curling through sweeping S-turns at speed with confidence-inspiring responsiveness. The boat is only available with the CATs, and it feels like a good match. I’m always a bit surprised when builders offer a number of different propulsion options—isn’t there only one that the hull was designed around? With the CATs, I was pleasantly surprised that there was a bit more throttle to go from that fast cruise, and I got the boat to top out at better than 33 knots (on a two-way average). Sound levels at that speed were 83 decibels at the lower helm. That lower helm, by the way, is at the forward end of an open and airy two-level saloon and galley. The galley and a dining settee are at the forward end, while a pair of sofas are down two steps aft. A 6-foot, 7-inch overhead makes for a spacious feel, as do huge windows. All of this combines to reinforce the importance of that carbon-fiber construction. 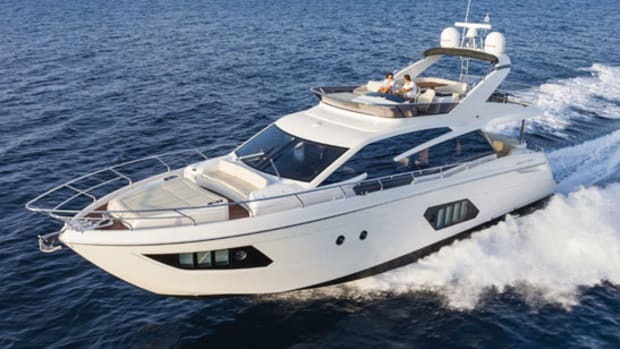 High overheads and huge flying bridges often add up to a different feel all around—mostly a high center of gravity if the weight isn’t managed on a motoryacht like this. While a two-seat helm station to starboard had a pair of wide-screen Raymarine displays, what really caught my eye was the “American bar” at the forward end of the galley, in which two swiveling stools share a high counter. I liked it not because I could see myself enjoying that spot underway, but because it was different. The boat has a distinctive finish, largely because the company drew from Milan’s Salon del Mobile furniture show to style this interior, using heat-treated oak and sycamore. It really pops. The designers created a lighting array that lets the owner program four different illumination presets, evoking the proper mood as the sun sets. A glass panel between the saloon area and the galley can frost to opaque electronically, depending on whether the food-prep area is a spectacle to behold or warrants some privacy, a feature of crewed European yachts that filters down to this size. There’s more. 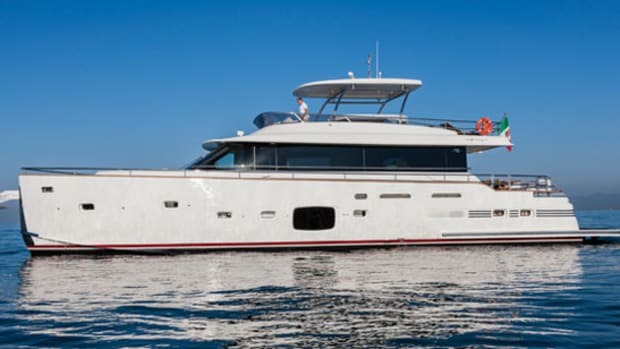 As a four-stateroom yacht (with crew’s quarters aft) the 66 Fly has huge amounts of space in the sleeping areas, including a 6-foot, 3½-inch overhead in the amidships master, where an athwarthships berth to port faces a two-person dinette to starboard. Opening ports in the hullside windows are better than 9 inches across, for ventilation at anchor. 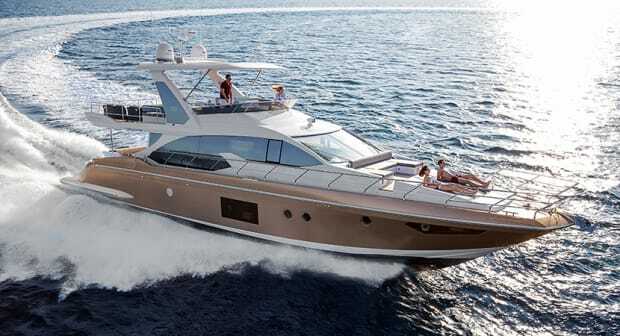 Aft is a master bath with spacious shower, providing a bit of a buffer against engine-room noise. For accommadations, a forward, en suite guest stateroom has a queen berth on centerline and a 6-foot, 4-inch overhead. Aft of that, you’ll find a pair of guest staterooms that share a head on the passageway, though there’s a separate entrance to the head from the twin-berth double to starboard. 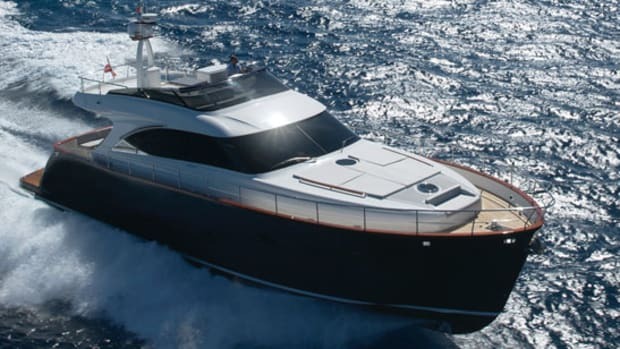 The space inside the 66 Fly reveals as much about her as the feeling one has while driving her from the flying bridge helm: She’s a combination of all her different elements. And the possibilities one enjoys are limited only by the vision of the beholder. 449 gal. fuel, no water, 5 persons, no gear. This article originally appeared in the November 2016 issue of Power & Motoryacht magazine.